The First National Bank building on Glen Street was erected in 1914 after the banking company outgrew its previous home. The Beaux-Arts style building was designed by New York architectural firm Mobray & Uffinger, and A.J. Robinson Co. served as the general contractor. The banking company itself came into being in January 1853, and at that time was called Commercial Bank of Glens Falls. Its original home was the Sherwood Building, which would be lost in the Great Fire of 1864, and later another building on the same site in Bank Square. In 1865, the company was reorganized into the First National Bank of Glens Falls. In the early 1900s, it was determined that the First National Bank needed a more modern office building that it would be able to comfortably grow into as it expanded. The foundation of the building was constructed using reinforced concrete, and the rest of the structure was built using granite and marble on top of structural steel. According to a source, the marble was brought in from Vermont and the granite from South Carolina. After the series of devastating fires in the city, great attention was paid to making new buildings flame-resistant. That was true of the First National Bank building, which was built to be completely fireproof with heavy wrought bronze doors, window frames, and sashes. Large vaults were installed to hold jewels, silver, and other valuable items, and a large emphasis was put on the building's security. Marble, tile, and bronze were used to decorate the building's interior and give it a lavish, rich feel. Construction was completed on the building in the summer of 1915, and an addition was added in the rear a few years later. 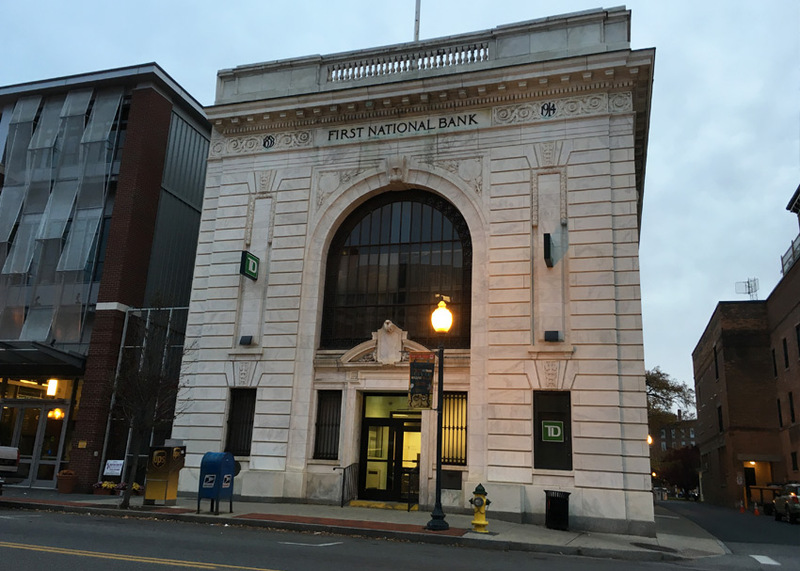 The company operated as First National Bank of Glens Falls for many years before changing its name to Evergreen Bank, and later merging with the company that is now part of TD Bank. TD Bank operated a branch in the iconic building on Glen Street from 1999 until 2015.